…from of all the papers written on vessel movement and try to simplify the way a boat really moves forward and how that is directly related to fuel burn and MPG, and then explain it the way, seemingly, most do not understand. The exact same propeller with one set of circumstances can require more or less power to rotate the same propeller RPM than when operating under a different set of circumstances. The particular set of circumstances is controlled by all of the following variables such as boat size, weight and shape, vessel trim, bottom condition, running gear design and underwater drag, along with other external forces such as weather (wind, waves & current). So, if you have an engine that is producing, let’s say 200 HP burning 10 GPH while traveling in a particular set of circumstances, then how well that boat actually performs will depend on the “circumstances” the vessel is traveling in, thus loading the PROPELLER accordingly under those given “circumstances.” But at least I can say this with a high degree of confidence – your diesel engine will propel you with measurably less fuel consumption than other types of internal combustion engines. And yes, within all the diesel engines available today, there are some variables. But, in the big scheme of things, it is less than 5% from the worst to the best. What that “less than 5%” really boils down to is the overall thermal efficiency or BSFC of the particular diesel you own. That really is a different subject which will be touched on later. Total weight of the vessel. All else being equal, a heavier vessel will load (make it harder to turn) the same propeller rotating at the same propeller RPM more than a lighter vessel. What this means is, as a vessel gets heavier (more fuel, more supplies, etc.) to rotate the same prop at the same RPM, the engine will work harder, thus using more fuel to do it. As the weight of the vessel increases, rotating the same prop at the same RPM will yield less speed on the vessel. Think of that as “propeller slippage” for lack of a better way to describe it. So if you put #1 & #2 together, you can see that each adds to the other. More power needed means more fuel burned yet the vessel is moving slower with the same prop turning the same RPM. This is a set of circumstances and they are, as I said, variable. Tied directly to this is Gospel #3. It IS NOT how much HP you have available in your engine, it’s how much HP you are asking for the engine to develop and TURN that propeller that equates to a GPH number, and thus how fast that prop moves your vessel under a particular set of circumstances. You have a new 50,000 lb 45 Ft “East Coaster” with a new QSM11 Cummins rated at 450HP at 2100 RPM and the vessel uses 10 GPH at 12 K’s at 1600 RPM & 800 RPM propeller speed (2:1 gear ratio) – A tad better than 1:1. You are one Happy Camper because you got all the performance you wanted and at 12 K’s, your engine is only loading to 45%, just loafing along. Now, to make my point, I go down to the vessel and reprogram the ECM for a 300HP at 1800 QSM Fuel Curve Rating. The owner takes the boat out the next day and brings it up to 1800 RPM and looks at his gauges. “WOW” he says – All of a sudden he sees a 70+% load on the engine yet the RPM, GPH & vessel speed is exactly the same. What happened? Actually nothing that matters has happened at all. We are still extracting the EXACT same amount of power from the engine – the “circumstances” for rotating that prop at that prop RPM has not changed so the vessel is performing at that RPM exactly as before. What has changed is, now we are asking the engine to deliver 70+ % of it’s AVAILABLE POWER. So the load % on the engine in relation to that AVAILABLE POWER is much higher. Does that mean we are adding more “wear & tear” to the engine and the engine may not last as long running it at 70+% load versus well under 50% ?? Think about it (answer at the end). SIMPLE thoughts on propellers, which is really what this is all about. Less propeller (diameter, less blade area, or pitch) means less HP will be used to turn the prop under any given circumstance. More propeller (more diameter, more blade area, or pitch), more PROPELLER RPM, or more vessel mass or resistance to movement means more HP is needed, hence more fuel per hour is used to turn the propeller at any giver propeller RPM. It seems that we have so many opinions of just how much a diesel engine burns, I thought I’d drop in another version of how that really works. I put this together about 10 years ago and just like now, nothing much has changed about all the perceptions out there as to how much fuel a diesel engine uses. See if this makes any sense. And, of course, if you can’t buy into this tutorial, you can always hit up Wikipedia, “BSFC,” and get their take on it. I wrote this before Wiki was born, made a few edits to simplify it, and yes, as always, there is always room for improvement. BSFC (brake specific fuel consumption) is an accepted and universally used measurement for gauging power output in relation to fuel consumed. Typical units used by Cummins, Caterpillar, Yanmar, Volvo, Isuzu, etc. would be lbs/hp/hr or grams/kW/hr. A universally accepted weight for #2 diesel is 7.001 lbs per gallon at 60 degrees F. Most manufacturers publish graphs showing BSFC at various rpm/load levels, and that, along with some interpolation, should help us determine that, generally, all diesels are their most fuel efficient (lowest BSFC) at peak torque. 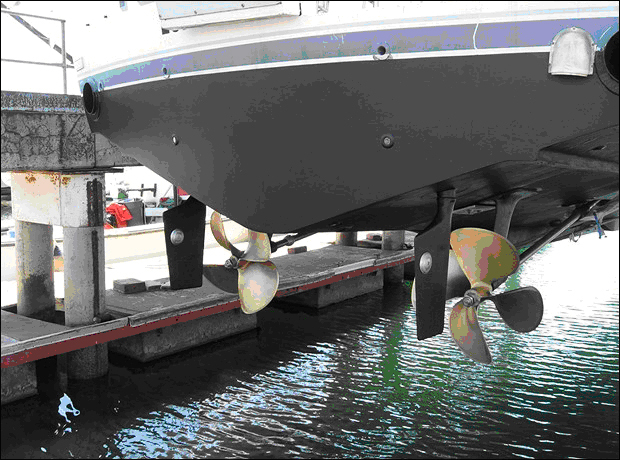 Of course, in marine applications, you would normally NOT be able to load the engine at peak torque except during hard acceleration. This is because a vessel with the correct prop and reduction ratio (propped to reach or exceed rated RPM under maximum loaded conditions) will prevent the aforementioned condition from ever occurring. All the diesels in marine service (and other types of service too) that I have come in contact with over the past 40++ years fall into a BSFC range of .450 to .325 (lbs/bhp/hr.) With a little math, one can derive the “magic number” of 20 hp/gallon/hr (.355) as this is a BSFC that matches (a high average) the amount of hp that is produced by a modern 4-stroke, direct injected, turbo charged/aftercooled high speed diesel of modern design. At the far end of this scale (lousy BSFC) you will find normally aspirated 2-stroke diesels (whose design characteristics date back to pre-WWII (Detroits for instance) with many being mechanically supercharged (although called NA’s) and a few NA, in-direct injection, 4-stroke diesels.You will also find at the best end of the spectrum modern engines typically designed and used for the very heaviest duty applications. By coincidence, the most efficient engines today used to produce rotational energy for marine applications (and, I believe, the most efficient heat engines available for any off the shelf application), are large (10,000+++ hp) diesel engines of the 2-stroke cross head design that operate at low speed levels (40 to 300 rpm), but do burn heavy fuel oil (higher BTU content per gallon of fuel). They are used mostly in large container ships and oil tankers to move extremely large shipments across the oceans. If looked at as a “cost per ton / per mile,” I don’t think even a railroad can come close looking at it that way. A two-stroke outboard engine (carbureted) may give you 6-8 hp/gal/hr. A two-stroke high output motocross bike (Honda CR 250, Suzuki RM 250, etc.) might give you 4-5 hp/gal/hr if you are lucky. Your Cox .049 model airplane engine running on methanol/castor bean oil mix is off my scale. I think more fuel comes out the exhaust than is used to make hp.The above relationships are for comparison and may help some readers to understand why a diesel powered vessel goes farther on a gallon of fuel than a gas powered vessel of similar size/design. Typically BSFC is better (7-10% is common) with engines that are “turbo-ed” due to the capture of some wasted exhaust energy that is then mechanically used to compress air (oxygen) which is then fed to the engine. This reduces “pumping losses” within the engine & allows an increase of air during combustion while increasing the extraction of energy from the fuel thereby allowing more fuel to be burned properly. The end result is, more hp output can be extracted from that engine, if needed.. Cooling the compressed air between the turbo and the intake of the engine is referred to as “aftercooling” or “inter-cooling” (I don’t want to argue the semantics of the two words/terms).. This further allows more air to be put into the engine because as the air is cooled, more oxygen is available due to the density increase from cooling.. Again, more fuel can be burned efficiently to make more hp, if needed. There are other benefits from aftercooling; it reduces thermo loading/stressing in the combustion areas of the related components and promotes less nitrogen oxide (NOx) to be produced during combustion. A popular misconception regarding turbocharging is that it increases stresses in the engine. To some extent it does raise the compression ratio, but for the same hp output from the same basic engine, turbocharging, in itself, is not the culprit. It’s the fact that more hp is available to use that MAY add to a shorter lifetime of the engine. From my practical experience with modern engines like the B & C Series Cummins and others specifically designed for turbocharging, I don’t feel this point contributes to how long the engine lasts.. Rather, it’s the “nut behind the wheel” concept that is much more the determining factor in the overall life of a modern diesel engine today. Could you provide some information on increasing the horsepower on my QSB 5.9 from 330 to 380 hp? From what I have read the adjustments can all be done in the computer. The engine is a 2007 serial number 46746xxx and the ECM code is 290100.03. Can I send in the computer for this modification or will a Cummins technician need to come to the boat for this adjustment? What is the cost for such a change? What EGT is within range for cruising speeds of 2200-2300 rpm? May I ask what you expect to gain from the engine up-rate? Post your current RPM’s, vessel speed, and GPH at 2000, 2400, 2600, 2800, and WOT RPM.. BE VERY ACCURATE.. The engine is in a 28ft sports fisherman that I use for diving and fishing on the west coast of Paradise. I normally keep the rpm’s between 2000 and 2350. The prop is a DQX 20×24. According to the Cummins spec sheet the 330 makes 811 ft/lbs of torque @ 2000 @ 6.9 gph and 763 @ 2200 @ 8.9 gph. The 380 version makes 898 ft/lbs of torque @ 2000 @ 6.6 gph and 841 @ 2200 @ 8.4 gph. My thoughts for the horsepower increase would be to gain an increase in speed and with the gain of almost 80 ft/lbs of torque @ 2200 which is where I run the boat most of the time, it should move the boat along more efficiently while burning slightly less gals/hr. I only have accurate numbers for the speeds/rpm’s listed below. VERY FLAWED THINKING. You are already about 10% over-propped. 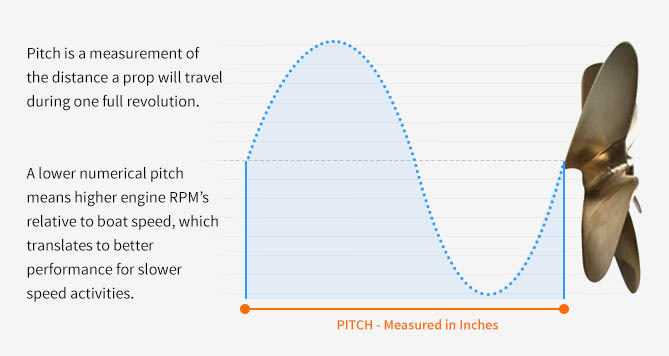 I really doubt you can even reach rated RPM, let alone what Cummins recommends – 2800 as the absolute Minimum , with 50-65 RPM over that as best. Look at the attached graphs to see where you are now.. It should be obvious that you are already asking more from the engine that Cummins recommends and you are on a short road to a short lived engine from overloading it beyond what it is designed for. If you want to increase the HP of the engine to 380, then you must re-prop so after the up-rate / reprogramming of the ECM, the engine can reach not less than 3000 RPM (3050 best) when the vessel is loaded as you use it. Then, IMO you can safely cruise at 2600 RPM or less for extended periods and not over\stress the engine. Please look at the propeller loading curves for the QSB. Yes, every boat loads differently, but from “Joe’s” numbers, one can easily determine that he is overloading the engine. Increasing to the 380 will not help as with the extended RPM range the engine needs even less prop to reach full RPM. Here is another or possibly better way to look at props and how they load an engine in a boat (using the QSM example). Look at comparison fuel burn numbers from the various graphs with some notes for the Cummins QSM11 that comes in many different ratings (same EXACT base engine but with different software programming of the ECM and with some hang-on component changes). Again, you must understand that the amount “FUEL BURNED” is the amount of “HORSEPOWER PRODUCED.” That is the COMMON DENOMINATOR, not ENGINE RPM, and NOT the actual rating of the engine. And, what makes the engine produce a given amount of horsepower is how the propeller loads the engine. Now understand that any of these engine ratings can make 300+ HP and all can do it at various RPM’s. But with the particular rating you choose, you are required to load, or “prop” the engine so it reaches not less than the minimum rated RPM when the vessel is loaded as you use it. If you follow that, then the engine will burn fuel (make HP) on a curve very close to the prop / RPM curve for that rating as shown on the power curve or “propeller curve” on the factory chart. Notes: (All engines propped to exactly rated RPM and all in the same boat with no other changes other than a re-rate or change-out of the engine). You must understand that the GPH number in each column is the HP being extracted or produced by the engine under the set of “circumstances” that the propeller is loading the engine to. The 715 QSM would carry the least amount of propeller with any given boat and would be the slowest at all RPM’S up to approximately 2400 RPM. 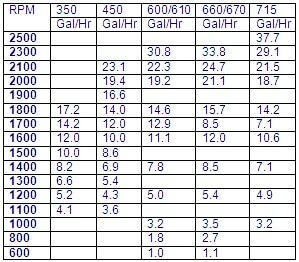 In fact, the QSM 300HP versus the QSM 715 HP version boat would travel at the same speeds at a steady state 1600RPM—see below. Both engines and both boats would be limited to about 215HP at 1600 RPM when “propped correctly.” At 1800 RPM the 350 could carry the most prop and be the fastest boat at a steady-state RPM of 1800 of any engine/boat combo and still stay within the recommended prop loading. How could that be, you ask? Just understand what I have been saying. At 2100 Cruise, the 670 Rating would yield the fastest boat of them all. The engine is this case will not have any additional wear & tear taking place. All I did was, when re-programming the engine, put an “electronic cork” under the throttle pedal, so to say. In fact, with the software/electronic governor and engine set this way, the engine would usually have a much longer life, as now the operator does not have the option to run hard even with the “pedal to the metal” and the engine at 100% loading for hours on end. In other words the “electronics” is limiting the HP of the engine to 15 GPH or about 300HP max. And I need to mention something else related to this discussion that chaps my hide way too often. It’s often said typical dock talk) that you must run a diesel at 70-80% load for max life/efficiency. I say total Horse Manure and the answer is right in this article. Just look at the QSM11 for a perfect example. Put the 300HP version of this engine on a dyno producing 215 HP @ 1600 RPM burning 10.6 GPH just like on the attached graph below, and leave it there “forever”. The 300HP version will be running at approx 72% load. Next to it on another dyno, use the 715 HP version and set it up to produce approx 215HP at the same RPM burning 10.6 GPH. The 715 HP version will be at about 30% load. Both engines would be on the “factory prop curve” at the same RPM ( how could that be?) . Outside of the maintenance that each engine would require when “running forever” , (and, I will take this to the bank) ———– Both engines will last the same as to “wear & tear” and both would have no measureable efficiency differences between them that matters. And, how long might that be? I’d say not less than 30,000 hours or 300,000 gallons of fuel burned at that load & RPM with all of the right maintenance done applicable to the engine. Hopefully now this can make some sense and lessen the amount of questions that pop up time and time again about fuel consumption, RPM, engine ratings, etc, etc, etc… The concept is so simple if you just read and understand the basics of how a propeller loads the engine in a boat. And to take it one more step using your own test – just cruise along with your boat at 2300 RPM going 24 kt’s burning 15 GPH per engine. The weather is calm and start paying out a small 12″ x 4″ diameter buoy on some 3/8″ diameter nylon. By the time you have 100 ft out, look at your boat speed. Put out another 100ft… Look again… Now put out 100 more ft… Same prop, but look at what has happened. RPM is the same, but look at your speed now (down 5 kt’s) and if you could measure fuel consumption, it’s probably up 20%. Really simple – external forces are making the prop work harder while those PROPELLERS MOVE THE BOAT, and THE ENGINE IS JUST TURNING THEM.